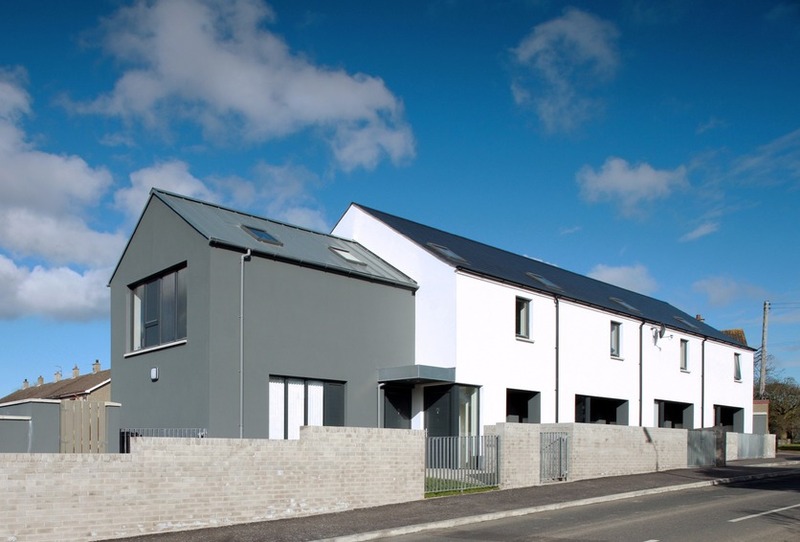 This site at Beechvale Road in Killinchy was purchased by Clanmill with an expired planning approval for 7 apartments but as there was no precedent in the area for apartment living the ultimate scheme was a different and more fitting solution. 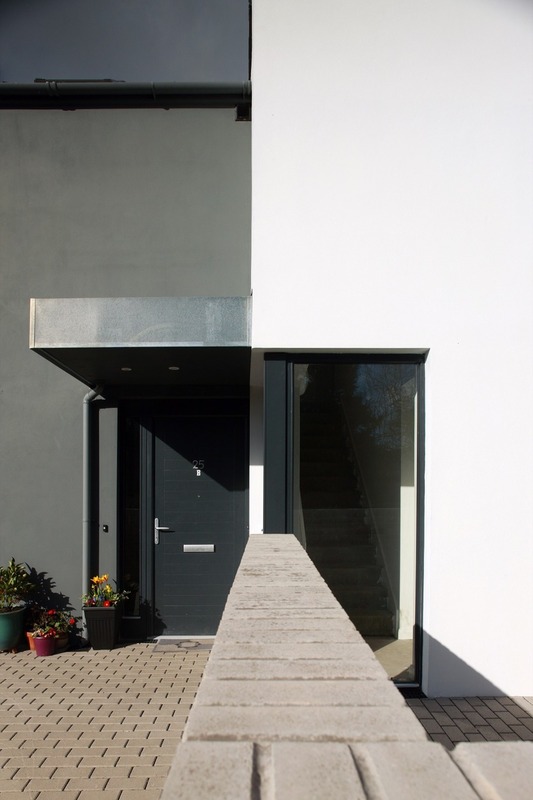 This scheme designed by BGA Architects is defined by its contextual restraint. It is conceived on a modest scale and pays tribute to its immediate surroundings. The architects felt; ‘It is important not to introduce something alien to the area in terms of form and materiality’. The primary form reflects the old Blacksmith’s building opposite and provides vernacular continuity. 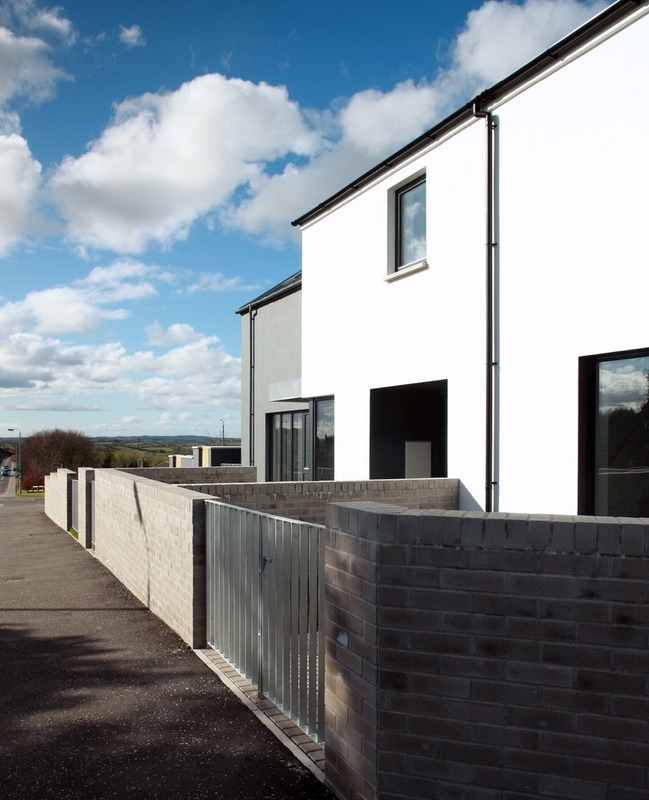 Also in terms of the scheme’s perimeter demarcation; the boundary walls that create defensible space are bare concrete block to reference the adjacent Housing Executive properties. The project, consisting of 3 houses and 2 apartments, occupies a highly visible peninsula corner site of 0.07 hectares / 0.16 acres and the scheme is perceptible from both approaches on Beechvale Road. It has regenerated the immediate site it inhabits and also provides a welcome architectural landmark in the locality. 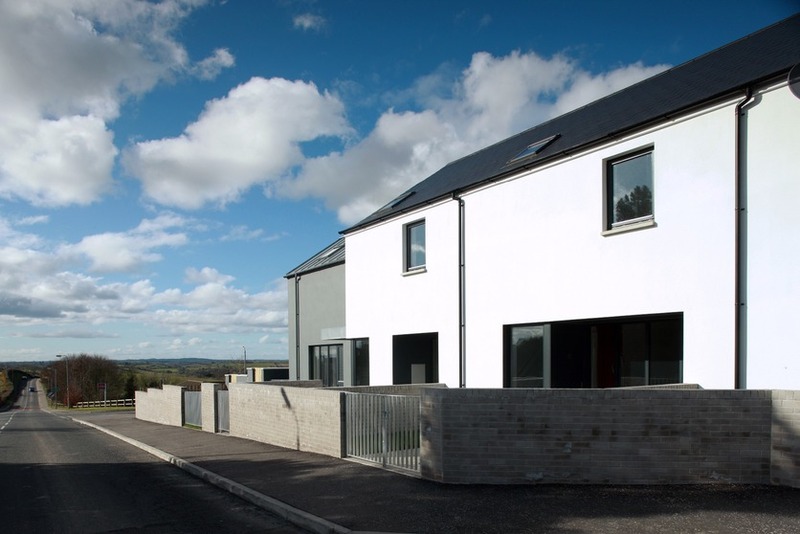 The defining motive of restraint is evident in the architects’ description of the design; ‘The simple built form acts as a modest key building for the immediate junction and when viewed from distance at various locations within this rural village. On the long vista approaching from Balloo House the grey gable is visible and it de-scales the scheme allowing it to nestle into the site. The front is understated and car passengers have almost passed the block before seeing it’. It is wholly appropriate to have understated site-specific architecture for this rural setting. Construction was completed over a period of approximately ten months. The detailing and finishes of the scheme belie its total cost is £620,000. This has been informed by planned intentionally on the part of the architects. They have skillfully matched their colour scheme and finishes to off-the-shelf materials. 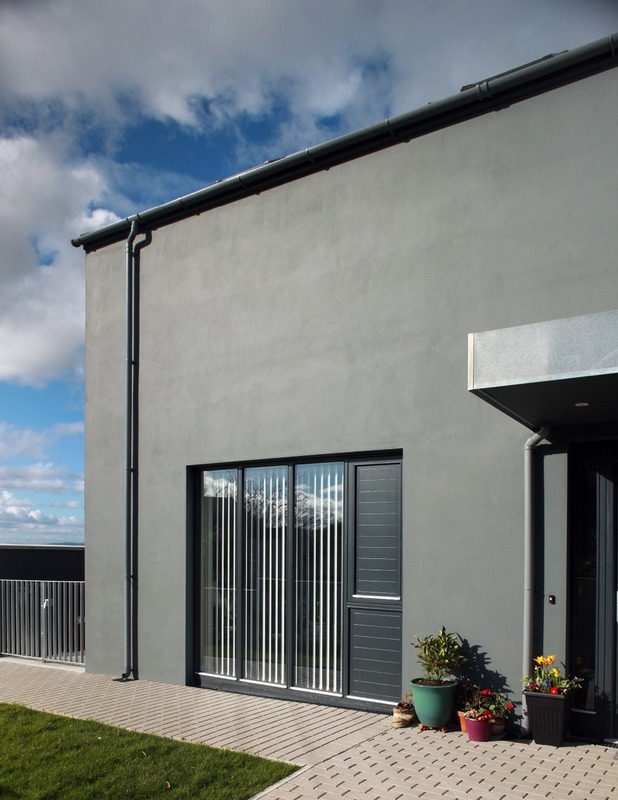 This can be seen in the concrete walls and the rainwater goods; grey downpipes were selected and the render painted in harmony. Subtle changes were made in terms of detailing that gave off-the-shelf materials a bespoke appearance. 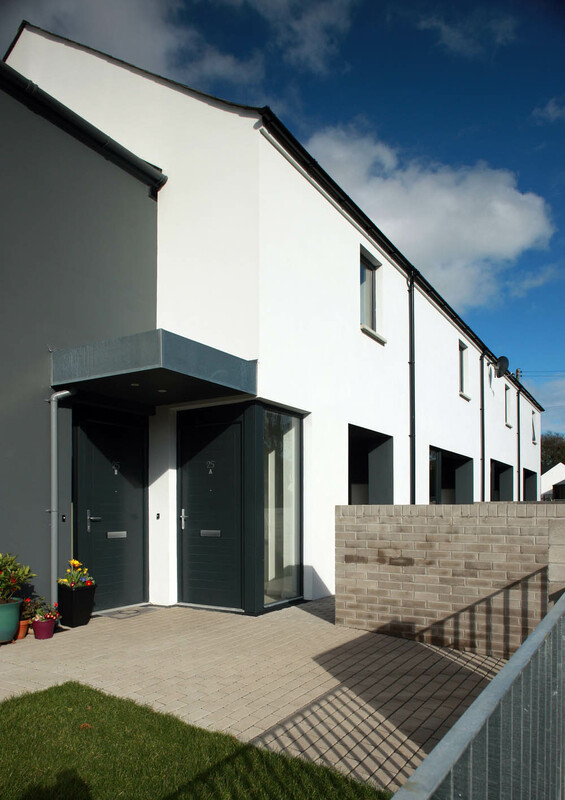 This is a cost-effective method of maximising the aesthetics of a scheme with a limited budget and it provides an excellent exemplar for sustainable design. 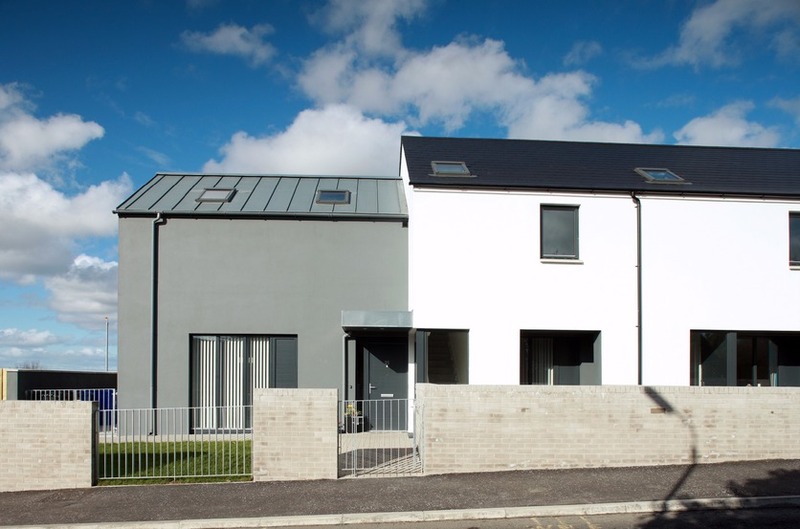 This is no doubt reflected in the scheme’s social housing commendation at the RSUA Design Awards 2016. In a building block of this scale and simplicity, legible articulation of housing and apartment units is paramount. ‘The single footprint is broken up with porch recesses, gable projections, rear returns and varied ridge lines. The primary roof is finished with slate while standing seam zinc covers the secondary elements’. The enunciation of formal elements is further enhanced through colour demarcation – the main block has white rendered walls and projecting walls on each end of the block are painted grey. ‘The requirement to have covered front doors and the desire not to simply bolt on [a] porch product, results in the front elevation having a series of recesses. The internal floor space lost to the recess results in side and rear projections to comply with the Housing Association’s design guide. The recesses and projections have floor to ceiling glazing making these relatively small units fell like much bigger spaces’. The inclusion of apartments in this scheme is hidden in the outward design. Instead of three houses and two apartments, the scheme appears to contain only houses, with the apartments expressed more like an extension on to the end house. This is intended to reflect an organic architectural design development for a rural context. The scheme could have been here for years, an evolving farmhouse, (like its inspiration the blacksmith’s house), rather than being a recent addition to the area. The external articulation has informed a bright and coherent interior. The morning sun infiltrates the kitchen / living spaces in the houses and apartments at the front of the block. Evening sun penetrates the houses from the rear. The houses have corresponding fenestration at front and back to create long vistas through each house and maximise light. Rooms are sufficiently spacious and practical. There is a different quality of light in the upstairs bathroom and landing as these are top lit through roof lights. This treatment of bathroom spaces is refreshing where the question has been asked by the architects; does a bathroom need a view? And if not how can light be more innovatively invited in? Equally the landing, through the presence of a roof light rather than a window, is no longer simply a way finding device and it can function as an office / study area. Externally this arrangement has been expressed as a single window above the recessed entrance, reinforcing the vernacular barn-aesthetic. This small scheme at Beechvale Road is refreshing. 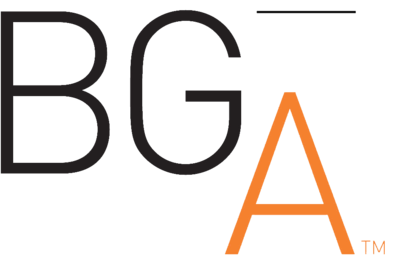 It expresses the architectural language that BGA Architects have been developing over the past decade; a new vernacular; traditional building vocabulary articulated through a contemporary interpretation and uncomplicated aesthetic. The scheme is born to inhabit its context and will doubtless act as vernacular inspiration for the next generation of architects.